Home » Blog » I’m a fresh meat, HELP! I’m a fresh meat, HELP! As always, this post is not sponsored by any of the below mentioned or linked companies. The opinions are purely those of the author. Welcome to roller derby! What an exciting time! You probably just got out of your first practice, fell in love with this amazing sport and are wondering : WHERE ON EARTH DO I START??? Don’t you worry, the Bout Betties Crew has you! We would like to offer you some suggestions on how to choose your gear when you first start out. Your best bet is to ask your teammates. Check out their gear, ask them what they like or dislike about it. Chances are if they are a vet, they’ve been through some gear but their gear may also be a little higher in price. Most likely they started with cheaper pads and cheaper skates and have upgraded since. In this article we’d like to show you what your options are if you don’t want to spend a fortune just starting out. As your derby career goes on you can always upgrade gear as needed. Before you buy any piece of gear make sure to measure yourself the way the manufacturer recommends and refer to their own sizing chart. Every manufacturer is different so sizes may be different. You can measure yourself with a cloth tape measure or a shoe string and ruler. Roller Derby is a full contact sport and a good helmet is your best bet for protecting your brain. We recommend looking at helmets that are ASTM (American Society for Testing and Materials) and CPSC (U.S. Consumer Product Safety Commission) certified. There are so many choices and in the end it is up to you but there are some helmets we do not recommend simply because they need to be replaced after one impact. We recommend multi-impact helmets but even those will need to be replaced sooner or later. Although this article was written in 2011 and helmets and testing has since improved, it is still a good guide and explains in more detail how helmets are set up and what the difference is between soft-foam and hard-foam. Another option talked about in the above linked article are ice hockey helmets. Some players choose them because they are HECC (Hockey Equipment Certification Council) certified, are adjustable and you can add a visor. It is important to note that even those have different levels of effectiveness. As you can probably guess, we aren’t helmet testing experts so I am going to include a link to Virginia Tech’s helmet rating for you to make up your own mind. If a visor is what you are interested in you may be happy to know that hockey helmets aren’t your only option anymore. S1 now offers helmets with visors. Some hockey helmets however offer a click in visor that removes faster than those visors that you have to screw in. -After narrowing your search down to helmets that are both certified and multi-impact, find the best option for your wallet. In the end unfortunately NO helmet can protect you 100% from a concussion. -A very important factor often overlooked is fit. We recommend you try on a new helmet in person at a store but if that is not an option make sure the helmet fits snug but not painfully tight. Ask someone who you know is knowledgeable to tighten your straps and help you test your helmet for fit. A helmet that slips back when you knock against it in the front is not a safe helmet. Keep in mind you may have to keep your hair styled the same way you did when choosing your helmet since different styles may make it fit differently. Below is a great video for making sure your helmet fits properly. There are many options for mouth guards starting at the cheap ones you can buy for under $10, going all the way to custom made ones. Most Roller Derby players will tell you that the cheap ones make it hard to talk or drink water and custom made ones are out of their price range. This article shows you the two of the most popular brands so you can make your own decision. Over time you may collect several mouthguards from different brands, and that’s ok because you’re bound to accidentally forget one at home so it’s good to have backups too. With elbow pads fit is almost more important than the amount of padding. You want pads that fit snug and don’t cut off circulation. Your best bet will be to try them on in person at a store or call a roller derby gear retailer that can help you find the best fitting kind for you. You will fall on your hands often. Again, fit is important. We recommend wrist guards that have plastic both on the bottom and the top for extra protection. Asking your teammates what kind they prefer and why is always is a great idea. Try on other’s gear when you can! Here is where padding is important! Recreational-grade knee pads made for inline skating are NOT sufficient. You can start with a basic Roller Derby knee pad but it is highly recommended you upgrade to a knee pad with thicker padding as soon as you start hitting. Some skaters add an extra layer of protection by buying gaskets. Those are padded sleeves that are worn under your knee pad. We recommend you buy the best knee pad you can afford. As with most of the gear a visit to your local skate shop that carries roller derby gear is your best bet to get a good fit. If that’s not an option, maybe a teammate with a similar body build will let you try on their pads. Finally, we are talking about the most expensive part of your gear and also the most personal one. Since this guide is geared towards fresh meat we will not be discussing the different brands and models out there. If you have expendable income and are dead set on getting a high end boot and plates you will find a plethora of recommendations out there. In any case your best bet again will be to visit a skate shop in person. If however you are starting out like the most of us with a limited budget here are my recommendations. The Riedell R3, Riedell Dart, or Suregrip GT-50 are absolutely sufficient for most beginners. In fact some vets on your team may still be in their beginner skates. Most likely because upgrading to a better skate isn’t cheap. These beginner quad skates come with the basic nylon plate, cheap toes stops and cheap wheels. The wheels may be fine for you first few months but after that you will most likely need to upgrade. Fit is very important with skates too. Therefore we recommend you try them on in person when you can. Keep in mind that quad skates come in men’s sizes and should fit snug but not so tight your toes are crammed. The toe stops however we recommend you upgrade right from the beginning so you have time to get used to how your weight balances on them and how they feel. There are a few different kinds out there. We recommend asking your team mates as usual but also just giving some a try. Only by using them will you realize if you like them. I know it’s not the answer your were looking for but it’s the best we have when it comes to toes stops. For all gear keep in mind that you will need to replace it sooner or later. Inspect your gear each time you put it on and replace it as soon as it is broken or doesn’t fit properly anymore. Elastic and Velcro will wear out over time and the fit of your gear won’t be the way it was when you first got them. 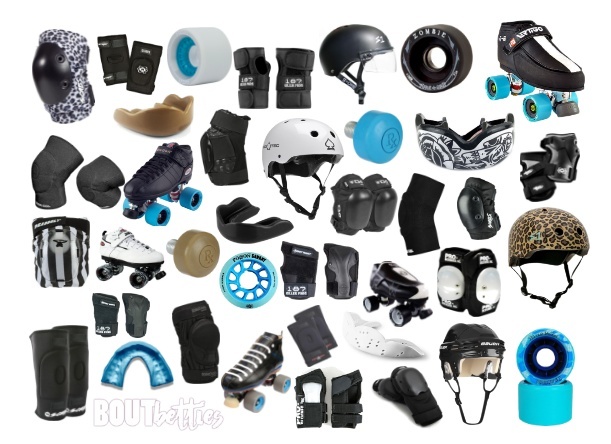 We hope this guide will help you spend as little money as possible while still protecting you sufficiently during your first few months of roller derby.